Also at the ceremony, three researchers received scientific honors, and two others were named to endowed chairs. Everest joined the OMRF board in 2008. 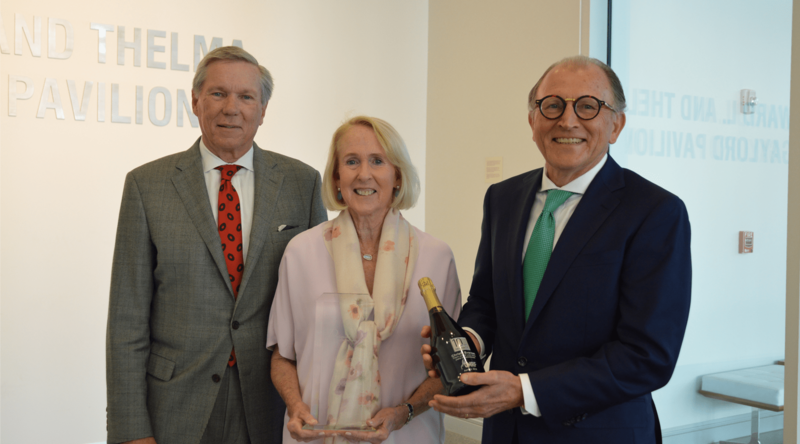 In the ensuing decade, she has served on OMRF’s Executive, Development, Technology Ventures and Governance committees and co-chaired a fundraising effort that raised more than $10 million for cancer research at the foundation. She has also contributed considerable financial support for research and capital expansion projects through the Gaylord Foundation and personal giving. Everest’s father, the late Edward L. Gaylord, served as OMRF’s board chairman from 1983-1996. Also at the meeting, OMRF presented scientific honors to three researchers. Darise Farris, Ph.D., received the Merrick Award for Outstanding Medical Research. Her work in the lab focuses on the roles of immune cells in autoimmune diseases, conditions in which the body mistakenly attacks its own cells and tissues. Scott Plafker, Ph.D., was given the J. Donald & Patricia H. Capra Award for Scientific Achievement for his field-leading studies of vision loss. Last month, he received a four-year grant from the National Institutes of Health to investigate whether a compound found in leafy vegetables could protect against age-related macular degeneration. Christopher Sansam, Ph.D., received the Fred Jones Award for Scientific Achievement for his innovative research on how DNA accurately copies itself during cell division, work that holds important implications for treating cancer and preventing birth defects. Also at the meeting, a pair of OMRF scientists were named to endowed chair positions. Swapan Nath, Ph.D., was named the William H. & Rita Bell Chair in Biomedical Research. Nath is an internationally respected leader in the study of genetic risk factors for lupus and other autoimmune diseases. Florea Lupu, Ph.D., was named the H. Allen & Mary K. Chapman Chair in Medical Research. He has been recognized for his seminal research in sepsis and blood clotting and is an authority in microscopy.